2 simple bitter melon recipes using pork cuts. Include some facts about the bitter gourd. As a child, I shun bitter melon, it is just too bitter. 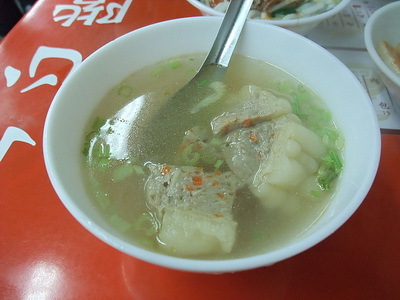 As I become older, I grew to appreciate it and it began with this lean pork soup, also known as 瘦肉苦瓜汤. It helped a lot that someone dear cooked it really well for me. Homemade bitter melon soup. Photo by Phoebe Lim. This recipe is a basic one. Add shrimps, mushrooms and egg if they are available in the house. Do not fuss over the quantity of bitter melon here. Use a medium sized melon and if it is less or more than 200g, leave it. Stuffing bitter melon rings is another common way to prepare it. Stuffing is usually made from pork or fish paste. Choose small slim bitter gourd for this dish. It will make keeping the stuffing in easier. Stuffed bitter melon rings can also be steamed on its own. Use the steam juice to make a sauce or glaze for the rings before serving. Wash the bitter gourd. Trim the stem and cut the bitter gourd cross-wise forming bitter gourd rings. Remove the spongy portion and seeds. Stuff the pork mixture into the middle of the ring of each bitter gourd. Sprinkle a little cornstarch on each side and pat gently to coat. Add the rest of the soup stock together with the rest of the cooking wine, chopped spring onion and ginger into a soup pot. Bring the soup to a boil. In Asia, anything bitter is thought to be good for health, many Asians believe the bittergourd or bitter melon has medicinal properties. Science has shown that the bitter gourd is rich in vitamins A and C. It contains substances that can stimulate the sensory nerves and improve appetite. It also contains a substance that resembles insulin and is therefore capable of reducing blood sugar. Its ability to metabolize blood sugar means that it is a suitable addition to the diabetes diet. This uniquely asian vegetable, also known as bittergourd, bitter cucumber or balsam pear. What does a bitter melon look like? Bitter melon is very easy to identify. It is pale or dark green, cucumber-like with a bumpy, grooved skin. bitter melons in various sizes. Photo by Seth Anderson. The best way to introduce it to the diet of someone who isn't used to bitter vegetables is to try to reduce the bitterness. There are a few ways to do this. One, slice it thinly and parboil it in salty water until it is soft but not overcooked. Then, add it to soups or stir-fries with lots of other ingredients. Two, cut them up, remove the spongy portion and seeds and rub with salt. Leave to stand for a hour or so before cooking. Rinse and dry before cooking. Younger fruits are less bitter so many are picked while still young. There is, however, a market for mature bitter melons.